Because I am always learning and reading, the way I write recipes is constantly evolving. I started writing my first book nine years ago, and my second, Bowl + Spoon, sixish years ago. Both before kids, when my time in the kitchen looked a bit more leisurely. I am a different cook now, changed both by experience and circumstance. I took a few of the recipes from the book, and edited them to both reflect my current recipe writing style and to work better for this program. I really want to streamline dinner prep, which I did not prioritize as much in recipe writing before I had kids of my own underfoot. If you do have the book, you’ll notice a few minor changes, but hopefully for the better! This is the most made recipe from our second cookbook. It’s the cover shot, for one thing :) The tahini dressing is delicious and there are all sorts of textures and flavors going on. It looks pretty and tastes good and makes you feel like you that healthy kind of full. A number of the components can be prepared in advance to help make quick work of the meal and I made those notes below. make ahead: Cook your grains. Make the tahini dressing in advance. The tofu can marinate for a day or two. use it twice: This tahini dressing is great on green salads and asian noodle salads with lots of chopped vegetables. We are making lettuce wraps next week and any extra of this sauce would be yum there too. kid friendly: Scale back on the chile paste in the tofu marinade, otherwise you should be good. I chop up the greens (least popular) and stir them into the rice (most popular) so they’re involved by association. carnivore addition: You could use chicken, fish or steak in the asian marinade, and simply grill it from there. low carb: Sub cauliflower rice for the grains. extra credit: In the book, I candy the seeds by warming them in a pan with 2 Tbsp. of light brown or muscavado sugar, big pinch of salt and small pinch of cayenne. You warm them up until the sugar start to stick, then remove them to parchment to cool completely. In a shallow dish, whisk together the coconut sugar, soy sauce/tamari, sambal olek, vinegar and sesame oil. Drain and press the tofu between a dish towel to absorb any excess liquid and cut each block into 1’’ squares. Toss them in the marinade and let them soak for at least 30 minutes, a few hours is even better, flipping them halfway through. Preheat the oven to 475. Line a rimmed baking sheet with parchment. Spread the tofu pieces on the sheet, allowing some the of marinade to drip on is fine. Bake the tofu pieces for 20-25 minutes, tossing halfway through until the edges are browned. 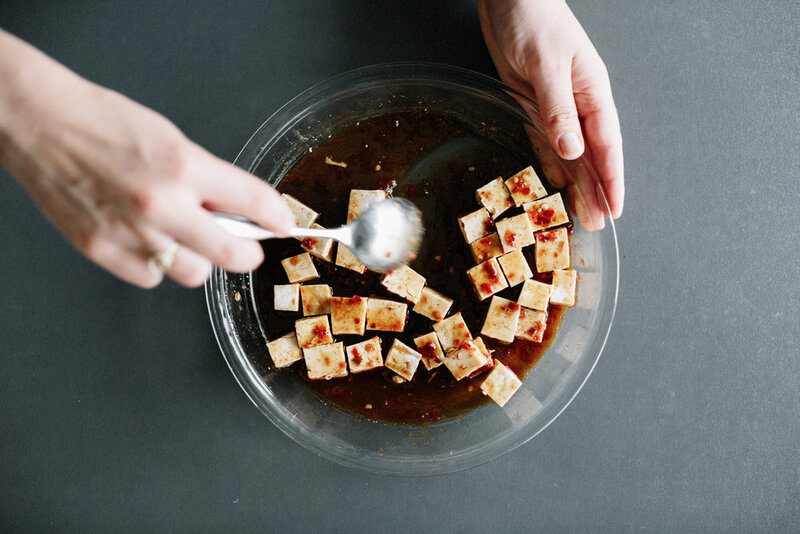 While the tofu roasts, whisk together your sauce. 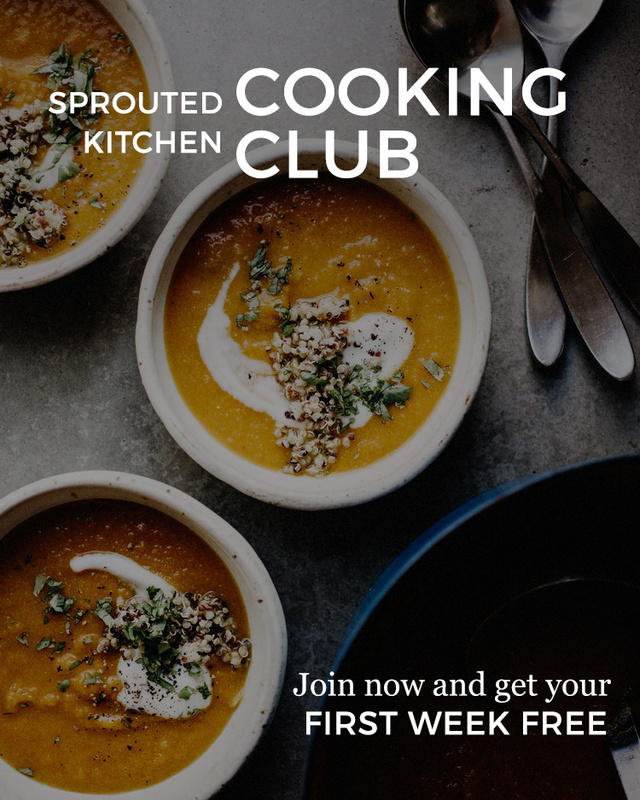 In a mixing bowl, combine the tahini, miso and honey and whisk to dissolve any clumps. Add the sesame oil, sriracha, vinegar, orange juice, pepper and whisk again. Taste for seasoning and set aside. Prepare your grains and stir in a pinch of salt and 1 Tbsp. of the olive oil. To quick sautè the greens, heat the remaining olive oil or coconut oil over medium heat in a large skillet. Add the garlic and sautè until fragrant, 30 seconds. In batches to have room in the pan, add the greens, a pinch of salt and lemon juice sautè until just wilted, about 1-2 minutes. Assemble your bowl with a portion of the grains, and then quadrant your other toppings on top: a scoop of tofu, warm greens, carrot ribbons and sprouts. Top with some avocado, a sprinkle of sunflower seeds and a generous drizzle of tahini sauce. It’s a great season to have friends over for a tortilla soup dinner. Cozy and delicious. You make the base and people can customize their toppings. It’s a great casual dinner option to affordably feed a crowd. Dried chiles or ancho chile powder may be tough to find, depending where you shop. You can use your favorite taco seasoning in it’s place. A blend is usually salted, so between the broth, seasoning and canned tomatoes, you may not need to add any. One of my resourceful testers told me she used cornbread mix in place of the cornmeal and it worked great, so there’s that too. make ahead: The soup may be made days in advance and kept covered in the fridge. Warm and add toppings when ready to serve. use it twice: Freeze any leftovers and use it for another meal. kid friendly: This is mildly spicy. The ancho chile does add heat too, but I don’t find it makes it too much for kids once the toppings are all in there. Let the kids garnish their own soups for fun. dairy free: Use a vegan butter alternative and skip the cheese on top. Heat the olive oil in a large pot or dutch oven over medium heat. Add the onion and garlic with a large pinch of salt and sautè until softened, about 5 minutes. Add the tomatoes and their juices to the pot, along with the dried chile, cumin and 4 cups of the stock. Turn the heat down slightly, let the stock come to a gentle simmer and cook for about thirty minutes, uncovered. With an immersion blender, or in batches in a standard blender, puree the soup until smooth. Stir in the butter and cornmeal and let the cook simmer another 10 minutes for the cornmeal to add viscosity to the soup. Stir in the shredded chicken or cooked beans. Add more broth, if needed, for desired texture. Taste for salt and pepper and adjust to taste. Soup can be made up to two days in advance to this point, and kept covered in the fridge. Garnish with a generous handful of chopped cilantro, avocado, cotija and crispy tortilla chips. This is from the sides section, but ya’ll asked for more salads, so I am going to leave it to you to fill it out as a meal. I will add a sprinkle or leftover grains and a couple hard boiled eggs. Chicken, steak, fish…you can truly add anything. Thin shreds of kale, a blend of sweet and tart with acidulated raisins and salty flecks of cheese. A simple salad that hits every tastebud but is so light it is nearly effortless to eat. Kale can hold up dressed in the fridge for an extra day or two, so save extras to pack for lunch or stuff in a pita the following day. Your bunch of kale and mine will differ in size, if you would like your greens more dressed, simply drizzle in a bit more olive oil and white balsamic. To expand the salad, add more of a tender green, like butter lettuce or mixed greens. make ahead: You can soak the raisins and chop the kale, but this comes together super easy. Think about what kind of protein you want to add and prep that as needed. use it twice: The dressed kale saves well! Double it up and take it for lunch the next day. kid friendly: Skip the raisins and pine nuts, and the dressed kale and cheese combo works great in an easy frittata. Combine the raisins, 1/3 cup of the vinegar and two tablespoons hot water in a small dish. Set aside to absorb liquid for at least fifteen minutes. If you want a more acidulated flavor, let them sit overnight. Remove the stems from the kale and chop the leaves well. We want small pieces, like something you could eat with a spoon, not large leaves. About five cups. Transfer to a large bowl and drizzle on remaining 1 Tbsp. vinegar, olive oil, a generous pinch of salt, pepper and red pepper flakes. Massage the dressing in with clean hands. Drain most liquid from the raisins, add them to the kale along with the pine nuts, shallot and pecorino to taste. Give the salad one more toss and serve. One day, in attempt to not waste a nearly stale box of brown rice crisp cereal, I threw some into the dry mix of our weekly batch of granola. I know this may not be for everyone, perhaps it is some sort of granola blasphemy, but now I don’t make a batch without it. It changes up the texture, giving you crispier bits between the shattering oats. My frugality has pleasantly surprised me. I use olive oil here, but a scant 1/2 cup of melted coconut oil works great as well. Play around with the spices and seeds of choice, but keep with the liquid sweetener to fat ratio in comparison to the dry ingredients. You’ll also notice this version doesn’t include dried fruit. I find that the fresh fruit is the sweetness I want, paired also with dried fruit ends up being too sweet. If your granola is more for snackings sake, less oft paired with more fruit, stir in the dried fruit of choice after baking - some apricots or cherries would be nice. gluten free: Make sure your oats are labeled ‘gluten free’. Oats are gluten free by nature, but are usually processed on shared equipment with wheat products. low carb: You can swap out some of the oats for more nuts and seeds if you’d like a higher protein and healthy fat snack/breakfast. Whisk together the olive oil, maple, sea salt, cardamom and cinnamon in a large mixing bowl. Add the oats, crisp rice, pepitas, sunflower, and seeds. Mix everything to coat. Spread the granola mixture on a large rimmed baking tray in a single layer. Use two sheets if it looks crowded. Bake on the middle rack for 40-45 minutes or until the mixture is toasty, stirring twice throughout baking to ensure all edges get crisp. Set aside to cool completely. Granola will keep in an airtight container for 2-3 weeks.